Towards the end of World War 2 many basic ways of life were affected economically, physically and politically. Germany , at the end of the war, faced many hardships and was split up into 3 sections that were occupied by some of the allied forces. Money was also an issue, since Germany had to pay a fortune to other countries in war debts. 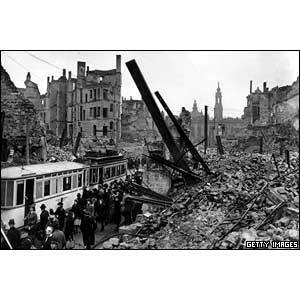 Towards the end of the war, the allies increased their bombing runs, so most of Germany was in ruins. In Germany, bombing and shelling had produced 5 billion square yards of rubble. Many historical monuments were destroyed, along with houses and other buildings. Millions of soldiers on both sides died, and millions more of civilians. So much chaos and destruction happened in World War 2 that most statistics are just estimates, so the real amount is unknown.